Majuro, Marshall Islands – More than 100 Marshallese activists in traditional vessels have rallied off the coast of the nation’s capital, demanding that leaders of developed nations dramatically upscale their plans to limit global warming. The activities are in the lead up to the Marshall Islands-hosted virtual summit of the Climate Vulnerable Forum (CVF) on November 22, the first-ever zero-emission Heads of Government level meeting, held entirely online. The Marshallese activists gathered in Majuro before heading to the beach where they massed around a banner that read “Survive. Thrive. 1.5”. Some of the activists gathered on the water in traditional wooden vessels. 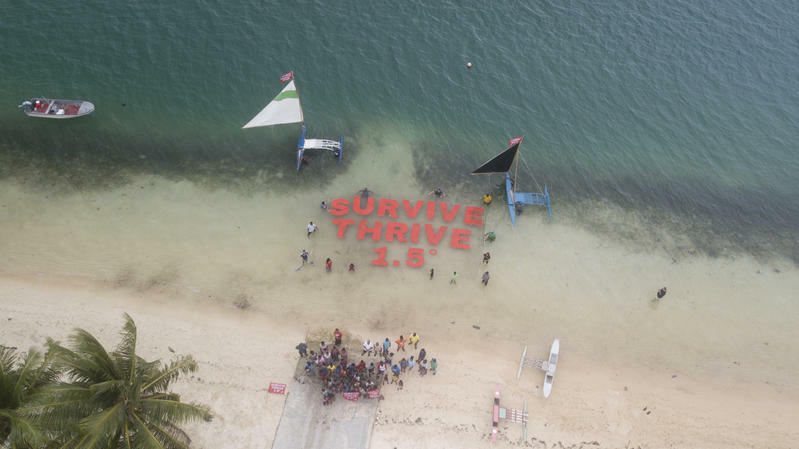 Pacific Island Represent activists in Fiji also made a human sign to spell out the words “Survive. Thrive. 1.5” in solidarity with the Marshallese. “Climate change is putting Pacific people’s way of life and the very existence of island nations in jeopardy. I am terrified to know that my three-year-old daughter will have to grow up in a world that’s heating up faster than ever before. She’ll be growing up with other Pacific islander children who may never know what it is like to live on the islands with the abundance they offer,” said Kelvin Anthony, Head of Pacific Net at Greenpeace Australia Pacific. 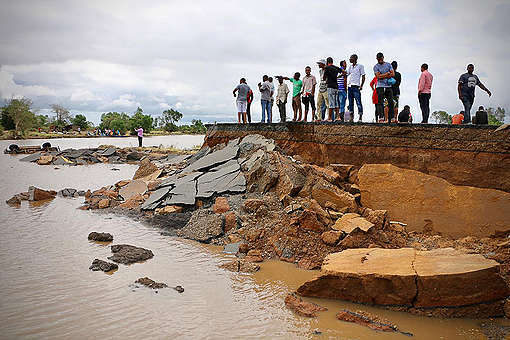 The leaders of the 48 nations most vulnerable to climate change, such as Bangladesh and the Philippines, will be present at the Climate Vulnerable Forum as well as the heads of state of a number of Pacific Island nations. The leaders of developed countries attending include French President Emmanuel Macron, Canadian Prime Minister Justin Trudeau, Dutch Prime Minister Mark Rutte and New Zealand Prime Minister Jacinda Ardern. At the Summit, CVF members are expected to respond to the 8 October special report on 1.5° Celsius from the UN’s Intergovernmental Panel on Climate Change (IPCC), which highlights the urgency to cut greenhouse gas emissions. 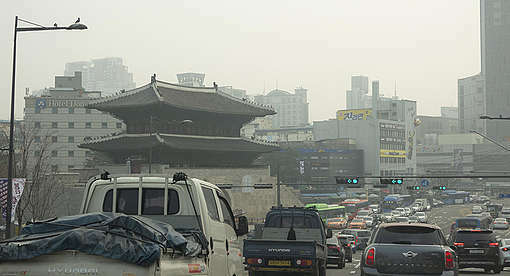 The need to raise ambition, led by high-polluting developed countries, will be a key element at the UN climate talks (COP24) in Poland in December, where governments will be challenged to strengthen their climate targets by 2020. The IPCC’s report shows that to achieve 1.5°C, carbon dioxide emissions must be halved by 2030 before falling to net zero by mid-century at the latest. “If small, vulnerable Pacific nations are able to clean up their energy systems, why can’t the wealthy and high polluting countries who have combined to bring the planet to its knees? Their actions will potentially flood our island states”, continued Anthony. The Marshall Islands are leading by example. In September the nation joined the small group of countries that have already announced plans to rapidly end their use of fossil fuels, and achieve carbon neutrality across their entire economies by 2050. They have also outlined an ambitious plan to power the nation with 100 percent renewable energy by 2050. “This Summit is a call to action for the world’s leaders to step up and prove that they’ve heard the voices of the world’s vulnerable and that they too will act with the responsibility and urgency demanded of them,” said Jennifer Morgan, Executive Director at Greenpeace International, and who is appointed by Marshall Islands’ President Heine as one of the all-women ‘Summit Champions,’ which aims to highlight the importance of women’s leadership in climate action. Greenpeace will have a team of experts available for comments.